What is Andaman Trunk Road (ATR)? Road: To shut or Not to Shut? Anthropologists believe that Jarawa are descendants of first humans that move out from Africa to Asia. Government of India started construction of Andaman Trunk road in the 80s. This road connects North Andaman – Middle Andaman — Port Blair (Capital in southern most part). Jarawa tribes mostly live in the jungles on the western side of this road. (see the map). After construction of the road, tourism started flourishing and this bought outsiders (guides, tourists) in contact with Jarawa tribes. Safari = tourists sit in a bus, go in jungle and observe animals. Meaning, they take a bus full of tourists on the Andaman Trunk road. The guide will bring Jarawa tribals from the surrounding villages, make them dance in front of tourists and offer them food as “payment”. Human rights activists have been demanding that Road must be shut down. Barely 400 Jarawas left. The road brings the general tourist population into unwanted contact with the Jarawa every day. Road is needed to carry essential food and supplies for both Jarawa and the settlers living outside Jarawa reserves. This has resulted in the Jarawa being exposed to diseases against which they have no natural protection: e.g.measles and mumps. If the road is shut down, the tourists cannot visit limestone caves and mud volcanos. So ultimately tourism industry will collapse. The increasing trade and tourism in the area is endangering their traditional skills. For example, some of the jarawas do not know how to make a fire without a matchstick. Jarawas have picked up the the vices of the outsiders: tobacco, gutka, Zarda, bidi and alcohol. It is their free will. Bo people= Another tribe in Andaman Nicobar. Its last member died in 2010. Do we want same thing to happen to Jarawa? Jarawa protection is important as they form the centuries old link of Indian civilization with African civilization. Do we want these people to live rest of their lives as primitive hunters and gatherers? Agreed very few of them left, doesn’t mean outside contact should be stopped. Because of above reasons, Jarawas must not be allowed to mingle with outside world. 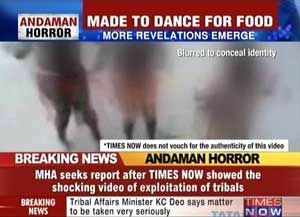 A reporter had gone to Andamans. He recorded a disturbing video, in which an Indian policeman is offering food to Jarawa tribal girl and making her dance to entertain the tourists. This story was published in The Observer (sister newspaper of Guardian), last year. This led to huge uproar in India and abroad. In past few weeks, you might have read Supreme court giving orders on Jarawa buffer Zones. But it is not that Supreme court picked up the matter after reading that Jarawa dancing video controversy. 2007 A&N administration brought a Buffer Zone notification in 2007. This notification prohibited any trade or tourism activity within 5 kms radius of the Jarawa Tribal Reserve. 2007 A tourist resort went to court against this order. 2009 Calcutta High court says notification is invalid. 2010 Supreme court says notification is valid. Orders the A&N administration to implement it. 2010-11 A&N administration doesn’t implement the notification due to widespread protests by local people who depend on tourism. Mid-2012 Supreme court asks why notification is not implemented? Supreme court puts “interim” ban on tourists from using Andamana Trunk Road. Only government officials, persons residing in the reserve and vehicles carrying essential commodities for the Jarawas would be allowed on the Andaman Trunk Road. This ban will be in effect until authorities come up with notification and seriously implement It (=no trade/tourism within 5kms radius of Jarawa reserves=buffer zone). March 2013 Authorities come up with notification, Supreme court lifts the interim ban. 1st 1960 UN Dhebar Need to update laws about tribal land transfer. 2nd 2002 Dileep Singh Bhuria Need to make a comprehensive tribal policy. examine various issues of development and welfare of tribals, especially primitive tribal groups. formulate a new legislation to protect tribal land. 11th schedule Functions of Panchayat. 12th schedule Functions of Municipalities. But these are not applicable to tribal areas. The tribal areas are governed by 5th and 6th Schedule. 5th schedule Administration of scheduled tribes areas in all states except AMTM. ( (assam, Meghalaya, Tripura, Mizoram). This 5th schedule is applicable to 9 states. 6th schedule Administration of tribal areas in AMTM (assam, Meghalaya, Tripura, Mizoram). Although Government earlier made PESA Act, to extend the provisions of Panchayati Raj to above areas but it hasn’t worked out as planned. So Now Government is thinking about creating 13th schedule for traditional governing bodies in tribal areas. The 3rd Tribal Commission will look into this matter. Majority of them live in car Nicobar. Their ancestors are believed to have come from Africa. At present, Jarawa population is estimated to be around 2000. The jurisdiction for Andaman and Nicobar Islands is with which High Court? Which of the following place is famous for its Limestone Caves and mud volcano? Incorrect statement about tribal Commissions. Constitution mandates that President must setup tribal Commission every 15 years. Last tribal Commission was setup in 1990. So far, four tribal Commissions have been setup. 5th schedule of Constitution is applicable to which of the following states? Punjab, Haryana, Jammu and Kashmir. Assam, Meghalaya, Tripura and Manipur. Rajasthan, Gujarat, Maharashtra, Madhya Pradesh. Bihar, West Bengal, Andhra and Tamilnadu. Tribals in India after 66 years of independence. Discuss the contribution of tribals in freedom struggle. The conflicting nature of development with indigenous people has come to the fore in Andaman and Nicobar islands. Analyze the situation and comment on the status quo. The State has failed to give the tribals a stake in the modern economic processes. Comment. List the Constitution safeguards for tribals in India. 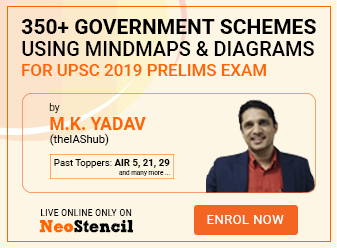 Write a note on structure and functions of National Commission for STs. Tribal Development under 12th five year plan. One group says Jarawas should be allowed to continue hunting, foraging and their primitive ways of living. Some people would say Jarawas should be assimilated into Modern human civilization-education, jobs, business, money and the joy that money brings in: cable TV, fridge, bike, car, mobile and internet. Where do you stand on this? People living in Union territories are at “disadvantage” compared to people living in big states. For example, State Governments of UP and Tamilnadu are giving free laptops to students, but you never hear that for Diu Daman or Andaman-Nicobar. Therefore, all Union territories should be merged with nearby States. Agree / Disagree why? Do you think there is a need to create 13th schedule in the Constitution, for tribal governing institutions- Yes/ No why? Major Inputs from Mr.Shiva Ram. Sir PESA is only for 5th schedule areas and not for 6th tribal areas. sir, what is meaning of ‘interim ban’ imposed by supreme court? i heard it many times in tiger issue as well as jarawa issues. Interim ban means ban for the temporary period until final solution is achieved. hi..to look at a overview i need the answer for mains questions..is it possible to get .? Also i want to know how to write answers for mains questions, if it is 12m,15m,20m,60m,200m. This is my first comment in this blog. If you find any mistake please ignore and forgive me. The information you posted here are just, fair and rationale. It is quite simple to read and understand. For all this my special thanks to you. Here i want to place one request. Prelims is just 99 days away so, i want to solve more and more question regarding GS. Can you post a cluster of questions for US sir..?